I looked out of the tent to once again see a grey, misty morning. In my mind I had seen myself waking up early to beautiful misty sunrises, enabling me to take some wonderfully atmospheric pictures but so far that hadn’t materialised. At least it wasn’t too windy and it wasn’t raining, although again the tent was soaked in dew. Today was to be a shorter day, just 11 miles although it turned out to be longer. I lingered for a while over my cup of tea and breakfast snack before once again squeezing everything into my too small rucksack and heading off. 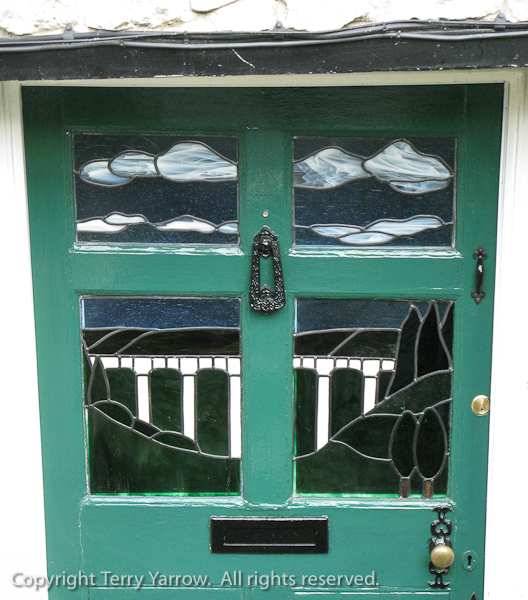 Walking back through the village of Uplyme I passed the cottage below with a stained glass window depicting the nearby viaduct. For a moment it took me back to my lovely stroll in the fading light of yesterday evening. 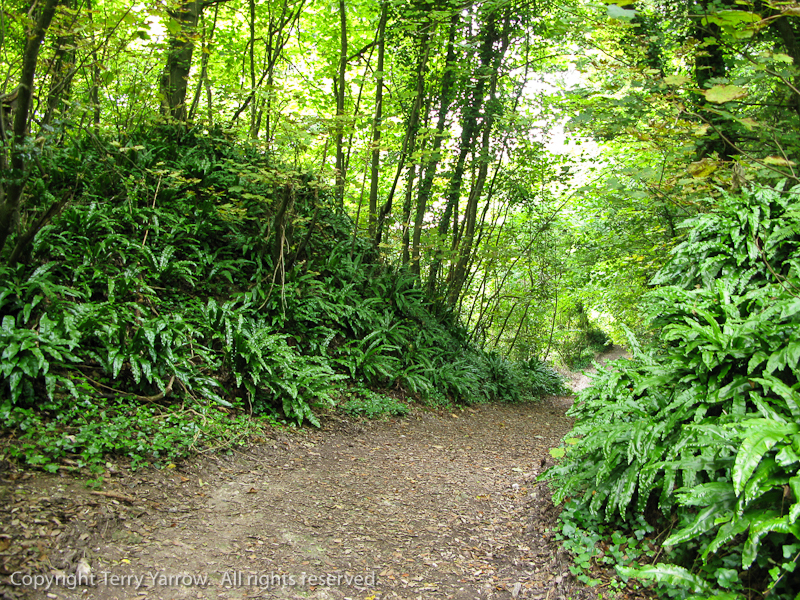 For a time I retraced my steps from yesterday to reach The Old Mill again, where I turned south to follow the River Lim down into Lyme Regis. 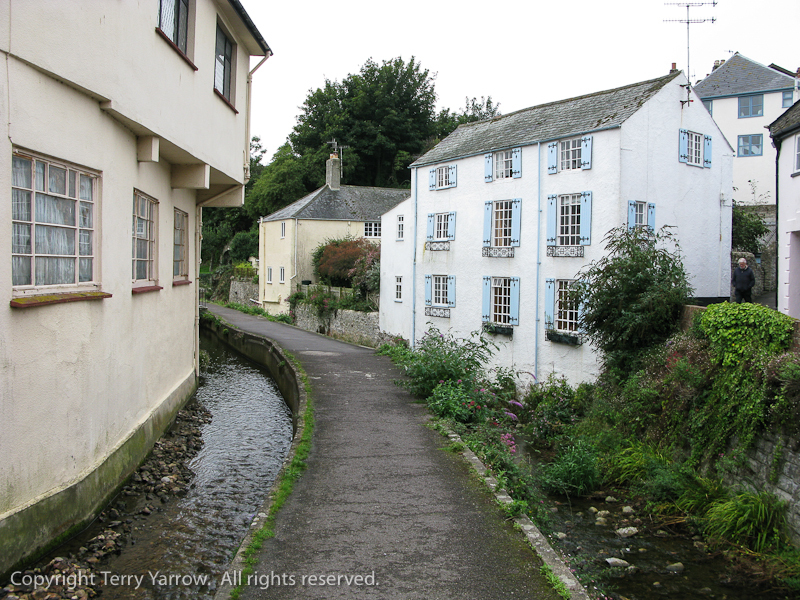 This was a lovely walk, part of which goes through the town along a ’causeway’ with the river on one side and the mill stream on the other and with some delightful old cottages. 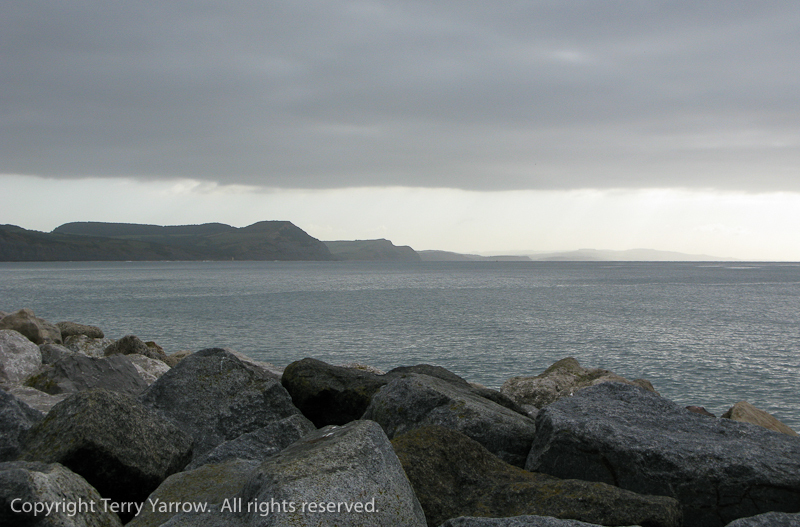 Lyme Regis is nicknamed ‘The Pearl of Dorset’ and dates from Saxon times although it developed more as a port in the 13th century. The town was once served by a railway but the line closed as part of the Beeching axe of the 1960’s, hence the disused viaduct two miles up the valley. It is probably most famous for its fossils and for The Cobb, the harbour wall built around the 13th/14th century which featured in the film ‘The French Lieutenant’s Woman’. It is a delightful place to explore although it is also a popular tourist destination. For me, the perfect time to visit is in the early morning as I did today. 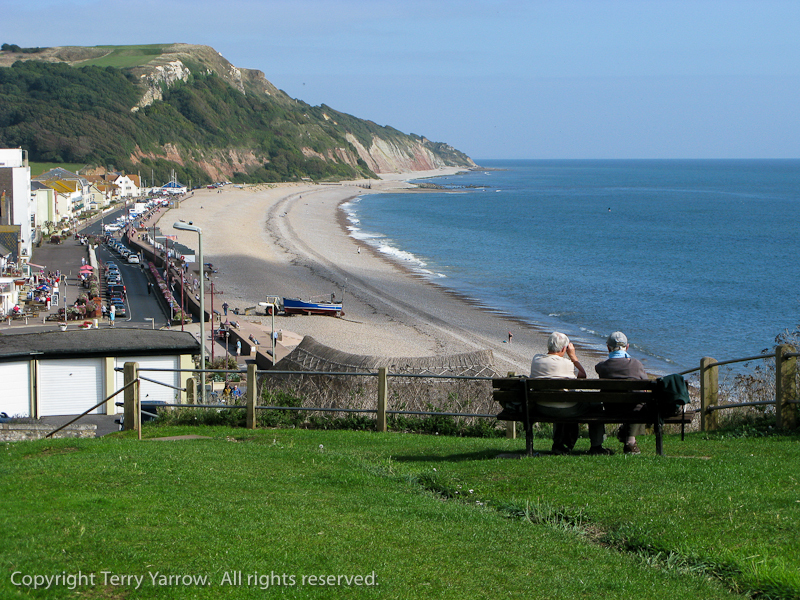 I reached the sea front and immediately spotted a cafe advertising bacon baps so I sat outside and enjoyed breakfast looking out across Lyme Bay to the coastline I had walked yesterday. In the picture above, Golden Cap, now clear of mist, is visible with its distinctive flat top. What a great place to sit and enjoy breakfast :)! 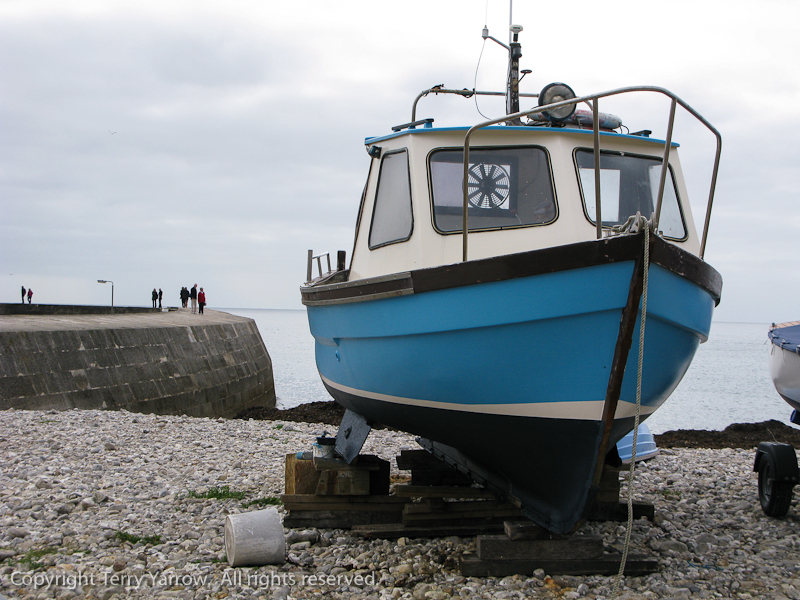 I had only walked two miles so it was time to move on and turning west, I headed off along the sea front with The Cobb ahead of me stretching out to sea. 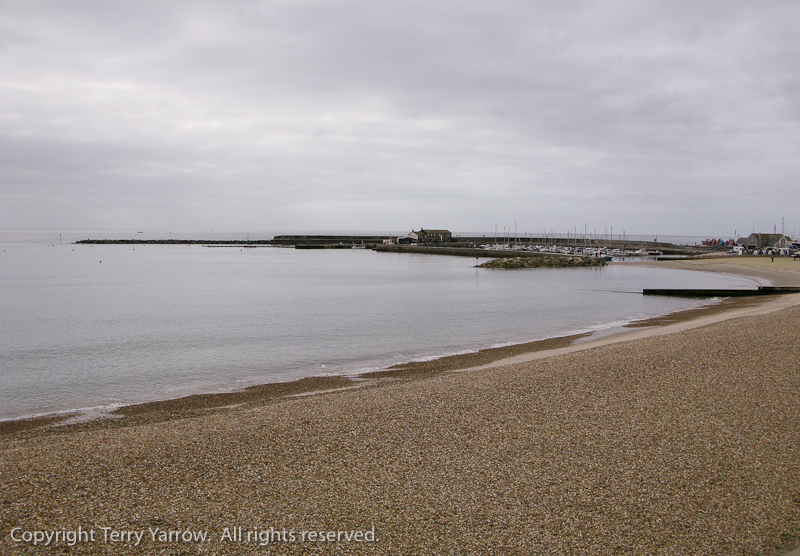 Having explored The Cobb, well no visit to Lyme Regis is complete without walking out on the old harbour wall, I climbed up to the coast path which follows the under cliff. The next few miles would be deceptively difficult as despite having no major headlands, the route unceasingly climbs and falls, weaving in and out of the trees along the winding, muddy footpath with slippery rocks, tree roots and other hazards, not to mention a million steps ;)! It is not a place to relax as you have to watch your feet constantly. Near the start I passed the sign below warning that it is 4 hours of arduous walking and no escape routes. But it is a wonderful place to walk! 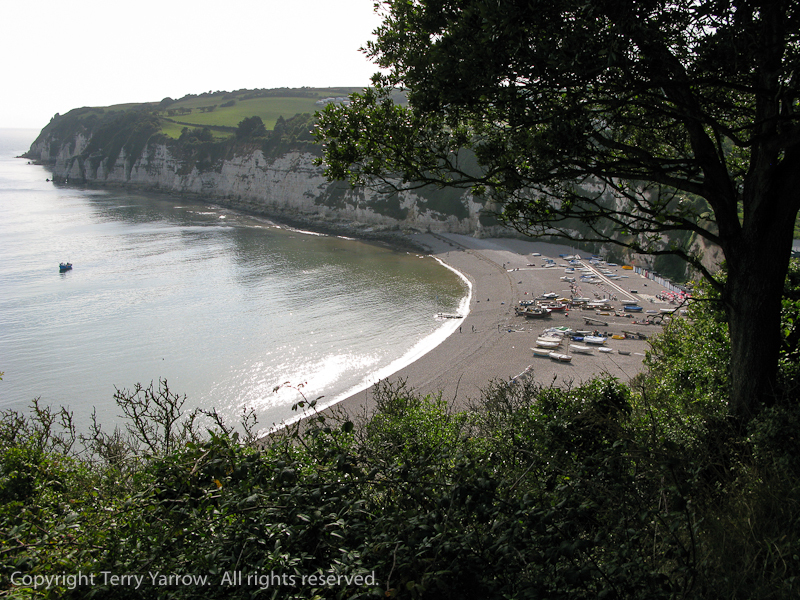 The Axmouth to Lyme Regis under cliff was formed by a series of huge landslides in the 18th and 19th century that created a middle ground between the cliff top and the beach. 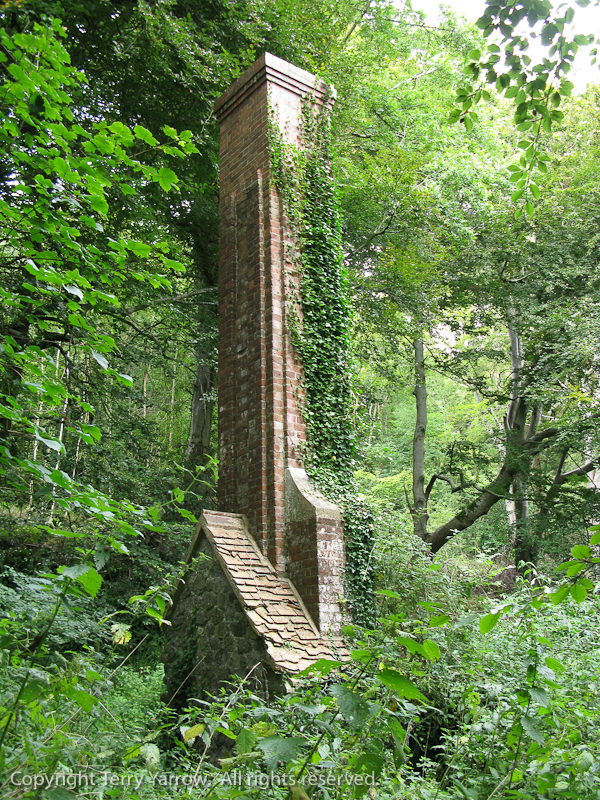 It stretches for some 7 miles and it was a fashionable place to visit in victorian times. There was even a cottage built there where cream teas were sold to the tourists. At one time it was grazed by sheep, keeping the undergrowth in check but over the years it has become more overgrown. It is now a National Nature Reserve and is a haven for wildlife. The under cliff is quite an eerie place with the dense undergrowth, overhanging trees and the constant dampness, especially noticeable after yesterday’s rain. It feels almost like a forgotten place, like some remote rain forest where no-one goes. 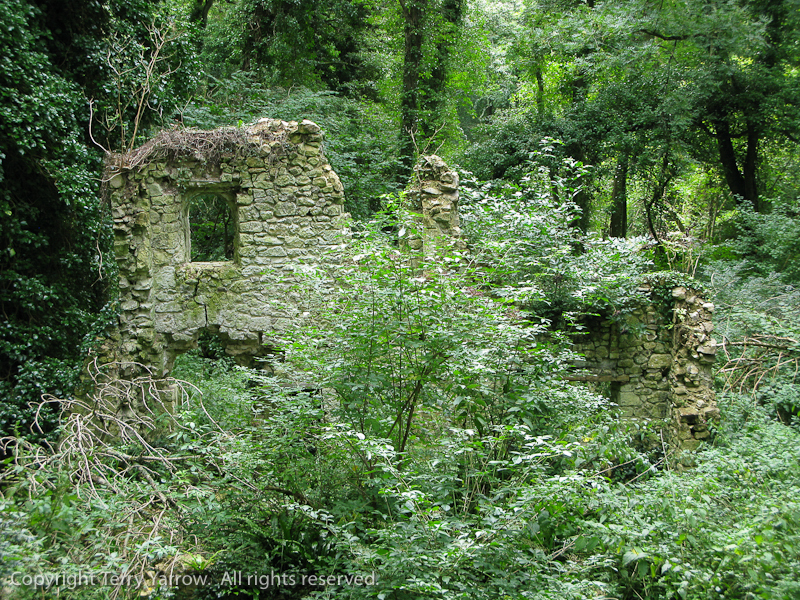 This feeling is emphasised by the few derelict cottages that lie amongst the trees. I often wonder who lived there and what their lives were like! There is a video of the walk on the web entitled, ‘The Path Goes on Forever’ and it can seem that way! Beautifully cool on a hot summers day but perhaps a little dark on a grey autumn morning such as this, so I was pleased when at last the way opened out a bit more and I could see the Beer headland ahead of me. My bed for the night was on that far headland and I had crossed the border into Devon. I was not out of the woods yet though as there was still more under cliff to go through but ultimately the path climbed up and out onto the cliff top with just the sky above me. And just for good measure, that was the moment the sun chose to come out. I sat on a seat and enjoyed a rest for a few moments before continuing up and over the headland and dropping down through a golf course to reach the River Axe.. 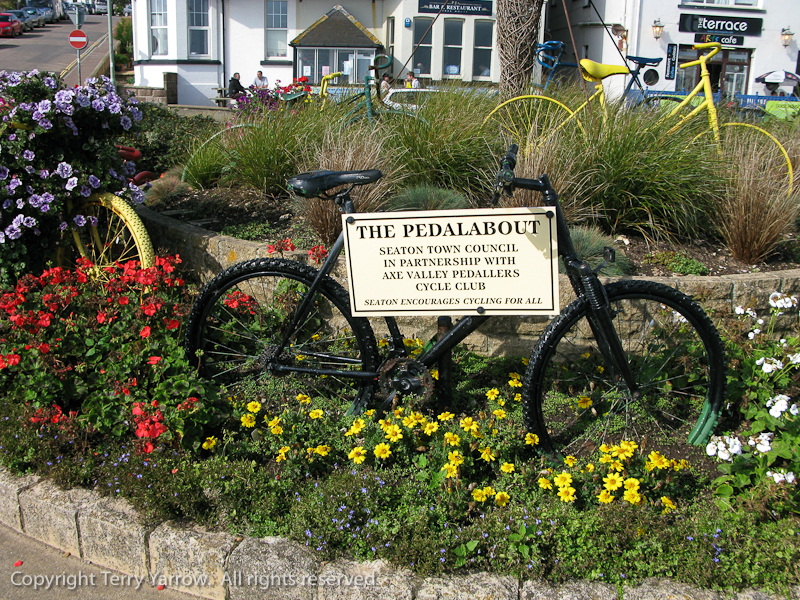 Crossing the river, it was then just a short walk into Seaton, a seaside town with rather an interesting roundabout, or ‘Pedalabout’ as it is known :)! 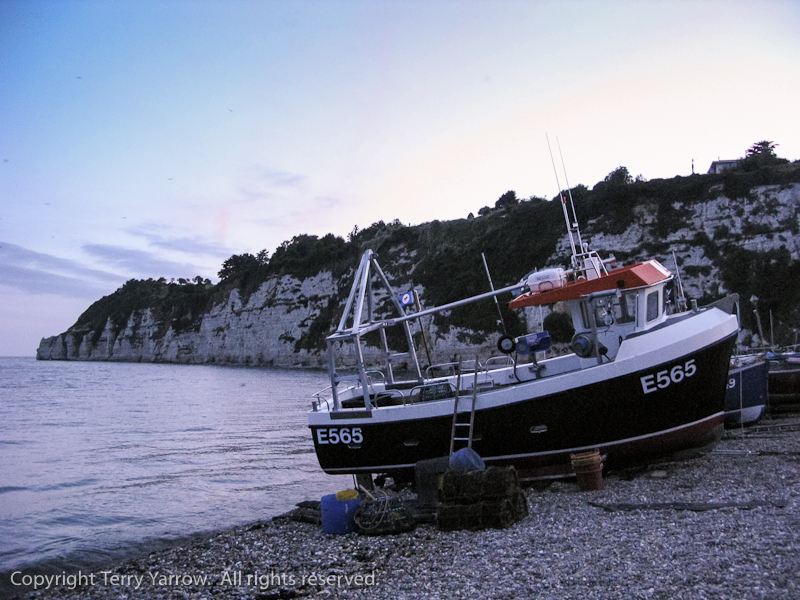 I didn’t linger in Seaton as in my view, its near neighbour Beer is much more attractive but I did take a last look back before climbing once again towards the next headland. 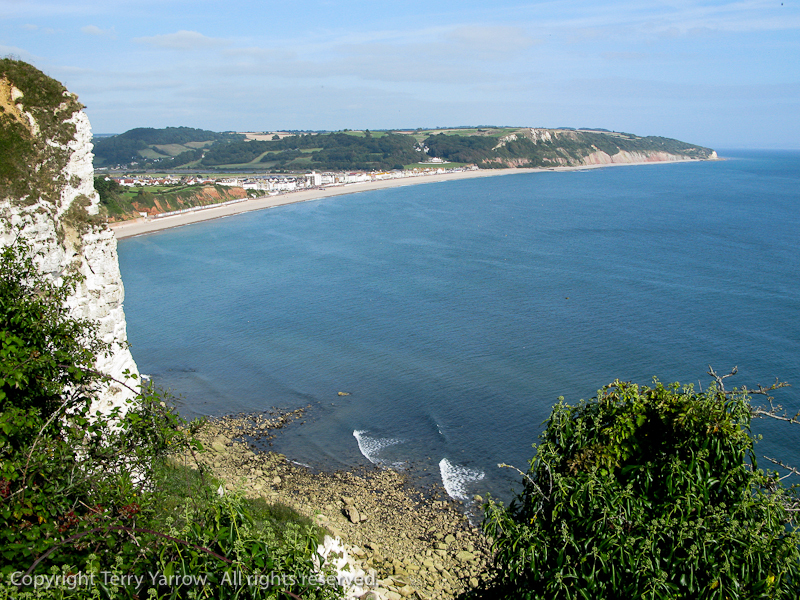 Looking back across Seaton, I noted a change in the geology from white chalk to red sandstone. This red rock would become a feature of the walk later. Theoretically, at this point I had just a mile and a half to walk but I hadn’t reckoned on yet another cliff fall until I came across the sign below. 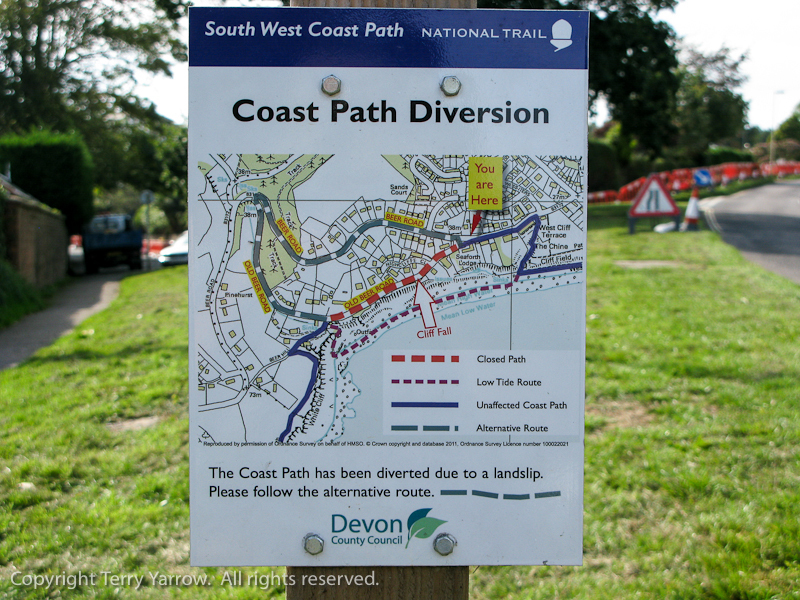 I diverted inland for an extra mile or two before rejoining the coast path near the top of the headland. I always like walking over this headland as the path is easy, meaning that you can enjoy the beautiful views in both directions. This is a welcome change from the under cliff where I had to watch my every step. 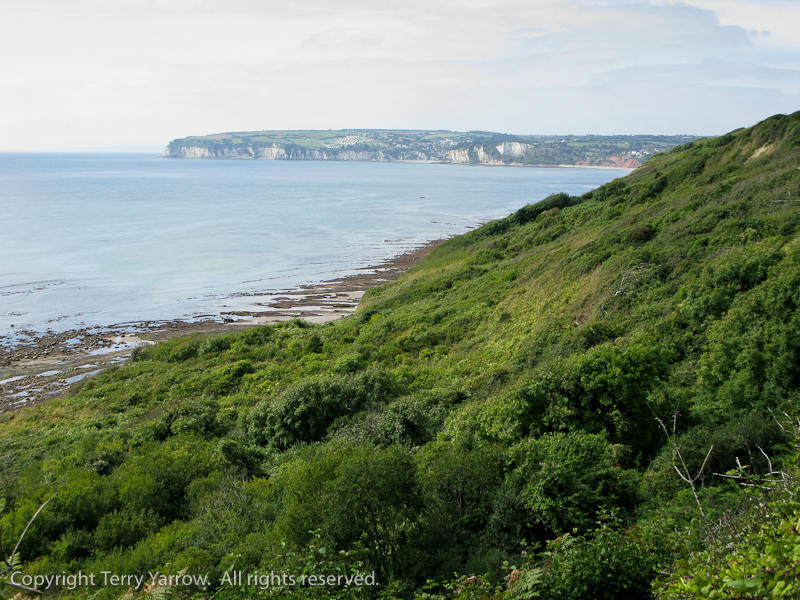 Looking east, I could see Seaton with Axe Cliff beyond…..
…..and looking west I had my first view of Beer. 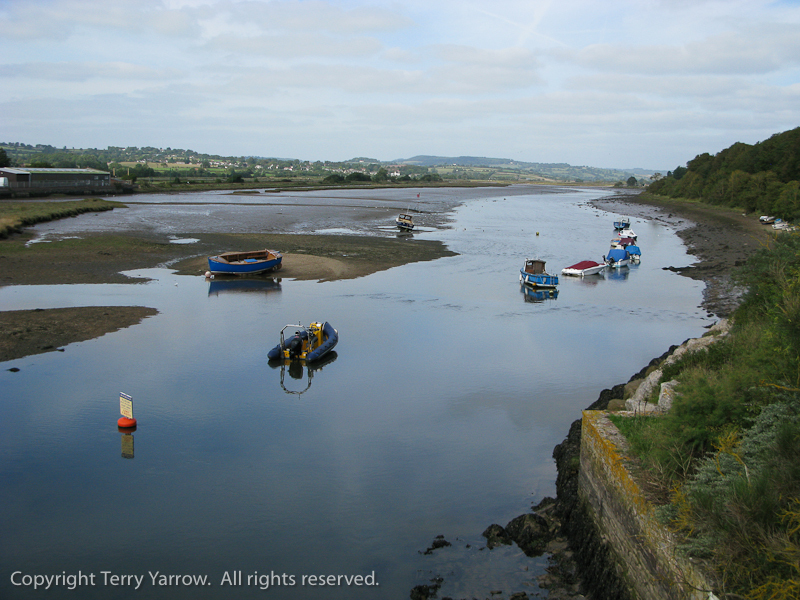 This beautiful coastal town gets its name not from the alcoholic beverage but from the Anglo-Saxon word for grove, as the area was heavily forested then. It grew up around what was a smugglers’ cove with caves that were once used to store contraband. Its main legitimate trades were fishing and lace making, with the former benefitting from the fact that Beer Head protects the cove from the prevailing westerly winds making it a very sheltered spot. Fishing still goes on today but tourism is probably the main industry now. As my camp for the night was on the headland, I continued up the hill to Beer Head and pitched the tent. It was only 4.15pm and there was plenty of warmth in the sun, giving a good opportunity to dry the tent, waterproofs and other clothes still damp from yesterday. And of course to chill over a cup of tea outside the tent :)! I was particularly pleased that I had now walked for three days with a heavy load and my ankle was still holding up well. Evening came and I walked back down into the village where there is a great pub, with an even better beer garden overlooking the beach. 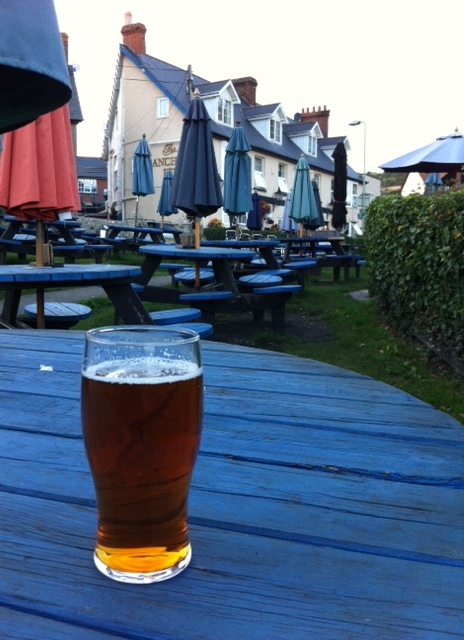 I sat in the evening light and had a beer in a Beer beer garden ;), and of course something to eat! 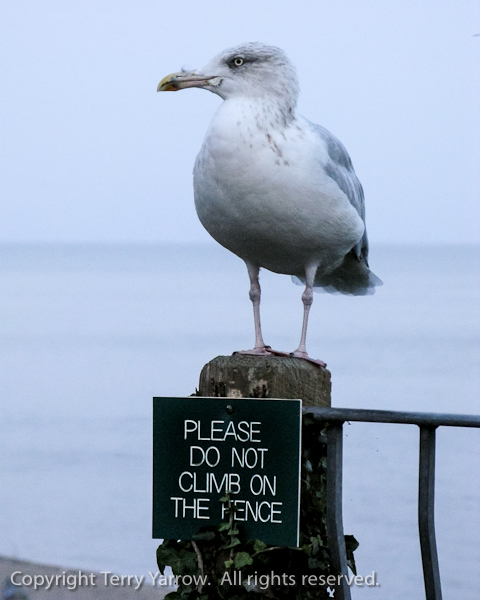 Oh, and I spotted the photographic opportunity below :)! Beer is such a delightful village, one of my favourite places and it was great to have reached camp early enough to be able to spend some time here. Strolling along the beach lined with fishing boats which had been winched up out of the water made a very peaceful end to a great day. The sun had set behind the headland, the gulls were wheeling around overhead and the air was still. Later as I walked back to the tent by the light of the moon with the village lights flickering below, the words of the poet came to me, ‘All was left to darkness and to me’. Perfect! I am really enjoying taking this coastal walk withy you. Such a picturesque part of the world. Thanks for sharing. Thanks Linny 🙂 It certainly is picturesque especially when the weather is right! 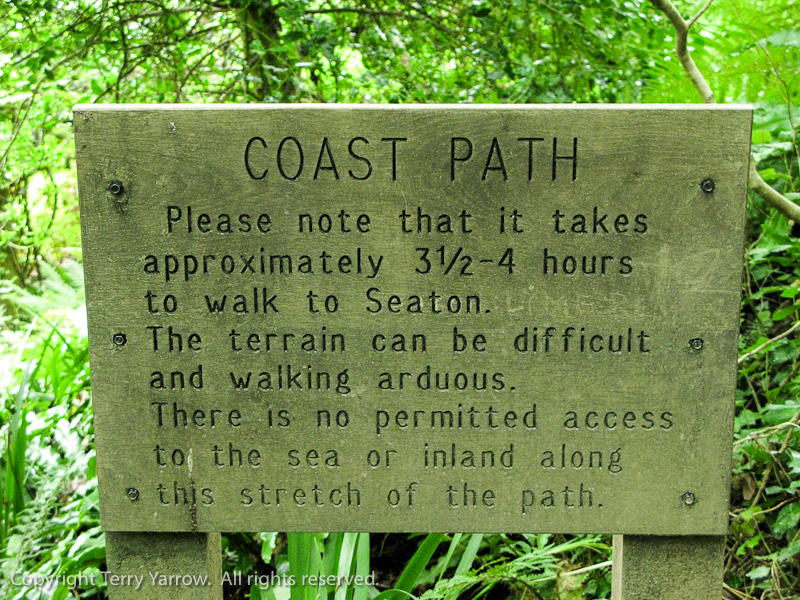 I enjoyed reading the part of your walk along the path from Lyme Regis to Seaton, it sounds like a really lovely and interesting walk. When I lived in Chard, Somerset, I use to regularly catch a bus to Seaton. Its a lovely walk Linda. Can’t say I’m a lover of Seaton though.